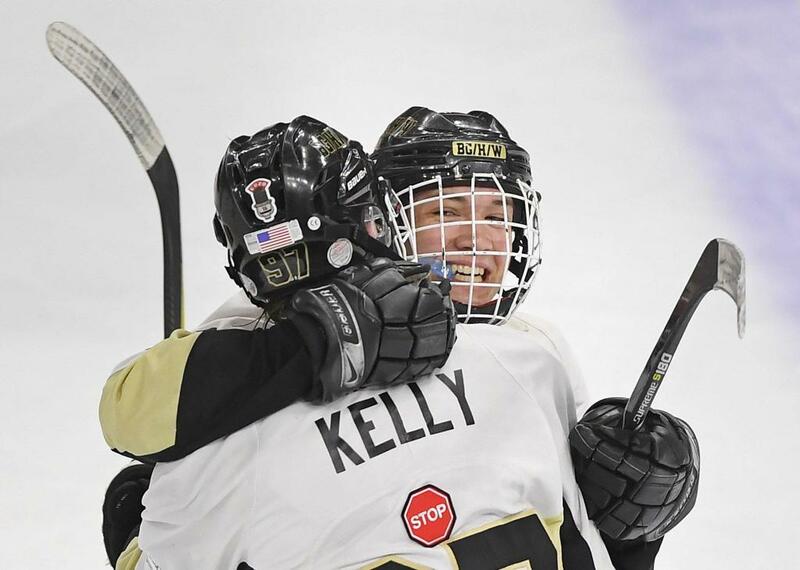 Hersey junior Brendan Buckley has skated since age 3 and has played hockey almost as long, but he said he didn't take the sport all that seriously until he started high school. Buckley, who is from Arlington Heights, played on the junior varsity team for Buffalo Grove-Hersey-Wheeling as a freshman, then played some on varsity as a sophomore and got even more ice time as a junior. His development paid off in a big way Saturday on the biggest stage of high school hockey. Buckley scored four goals to help BGHW defeat Waubonsie 7-2 in the AHAI combined state championship game at the United Center. The Stampede won their second state title in three seasons. The combined division is for boys hockey teams that draw players from multiple high schools. Waubonsie includes players from Waubonsie Valley and Metea Valley high schools. "It was just amazing," said Buckley, who had not scored more than twice in a game all season. "This whole thing was amazing: winning the championship, playing at the United Center, scoring the goals. My teammates really set me up well. They found me." Buckley joined the Stampede his freshman year on the recommendation of a friend. BGHW coach Chris Waters, a Libertyville resident, said Buckley has improved steadily during his three years with the Stampede. Connor Kelly, a Buffalo Grove senior from Arlington Heights, assisted on all four of Buckley's goals and scored a goal of his own. Kelly said that it's easy to pass the puck to a teammate who has a hot scoring hand. "Oh my gosh, he was just scoring over and over again," said Kelly, whose goal came off an assist from Buckley. "When I saw him open, I just dumped it over to him and it went in." Buckley had a solid season for the Stampede (47-14-4), but he wasn't the go-to goal-scorer. He finished second on the team with 36 goals and 39 assists, while Kelly led the squad with 74 goals and 48 assists. "All five players (on the ice) have to know their roles," Waters said. "You can't beat a team going one-on-five. "If you ask (Buckley) about his four goals, he will say it was his teammates who made it possible." Buckley also credited his success to playing on the first line with Kelly and Sean Brawley. He said they help find each other scoring opportunities. "That was more of a grinder line," Buckley said of playing on the second line last season. "We would go out there and hit guys, rough them up. It helped me get up to varsity speed. This year, we're using much more skill." Buckley scored his first three goals in the second period as BGHW stretched a 2-0 lead into a 5-1 advantage. After he completed the hat trick, he added the fourth goal midway through the third period. Eric Kurpiewski and Paul Kruchten scored the Stampede's other two goals. The Warriors finished the season 35-20-1.